Credits: Papers from LivEdesigns’ SsunFun Paper pack — Moss, Sidewalk Chalk, Stripey and Vineyard. Elements from PouYou’s Pink & Me kit — round stitch / couture 2; Scrapmatter’s Life’s Little Surprises Kit — dbo staple. Over-rated or not, I am a fan. Whether it be the fresh-never-frozen patties, the sweet, toasted buns, the sweet and tangy spread or the fresh lettuce, onions and tomatoes — all together, it is one burger that is without equal – still. The quest for the best burger is still on for many but I think unless I stumble on another that can equal or top this, I remain a fan. 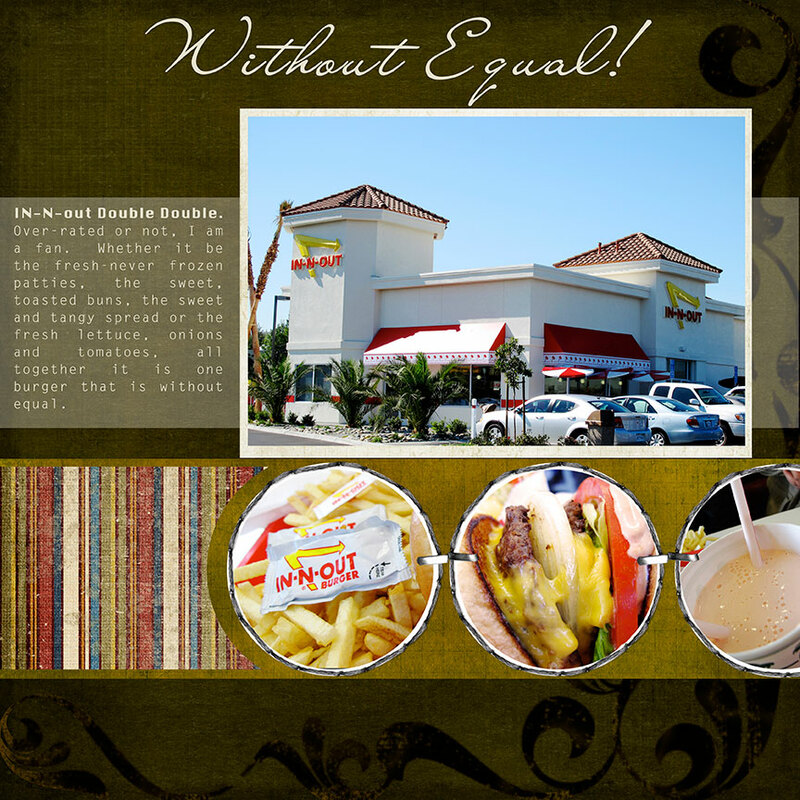 In-N-Out is the place to get real fresh burgers, great shakes and the hottest fries. The menu so simple, unless you go for their Not-So-Secret Menu, has just 3 choices. It’s the fries that keep me coming back. I love the burger but I am one of those still unsatisfied with it and hoping there’s better out there. Until then, this is the best I’ve ever had.